Whenever we are not standing, sitting or lying down, we are moving. We can learn to move and to walk with awareness. We do not need to rush. We have arrived with each step in the present moment; we can step in the Pure Land or in the Kingdom of God. When we are walking from one side of the room to the other or from one building to another, we can be aware of the contact of our feet with the earth and of our in and out breath. As we breathe in we can say “in,” as we breathe out we can say “out” silently. We are aware that we are alive with each step, not carried away by our thoughts and emotions. 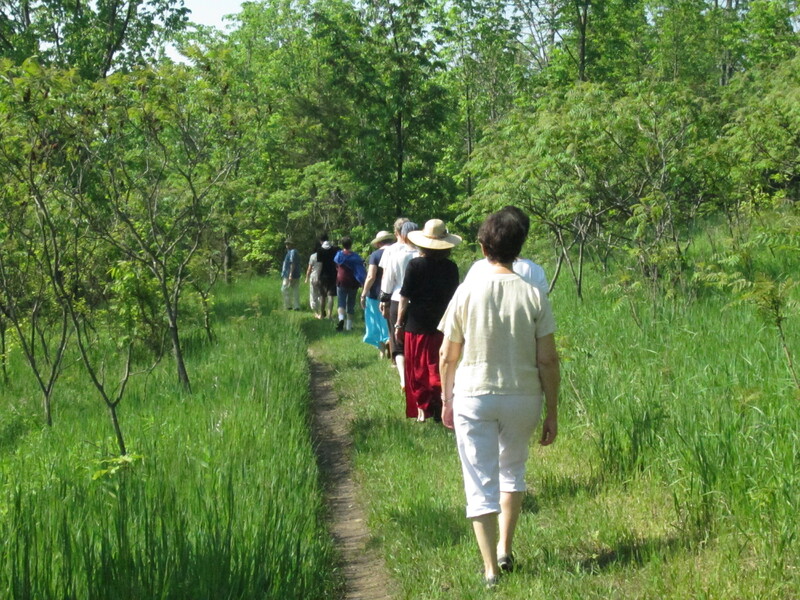 We can train to practice walking meditation all day long. It is a wonderful practice which we can do anywhere and at any time; therefore, it has the capacity to transform our everyday life. Let us walk as a free person and feel our steps get lighter. Let us enjoy every step we make. Each step is nourishing and healing. As we walk, imprint our gratitude and our love on the earth.Walking in this way should not be a privilege. We should be able to do it in every moment. Look around and see how vast life is, the trees, the white clouds, the limitless sky. Listen to the birds. Feel the fresh breeze. Life is all around and we are alive and healthy and capable of walking in peace.